In December the Air Force will launch its first OTV also known as the X-37B Orbital test Vehicle. This small unmanned Space Shuttle-type vehicle will launch from the Cape Canaveral Air Force Station grounds on an inaugural mission to test out its systems and capabilities. After the mission is completed it will land at Edwards or Vandenberg Air Force Base in California where it will be inspected and subsequently prepped for another flight. The OTV is one-quarter the size at twenty-seven feet in length compared to the Shuttle’s length of one-hundred and twenty-two feet. The OTV has a cargo bay about the size of a large refrigerator at seven feet by four feet compared to the Shuttle’s payload bay which could hold an object the size of a bus or a railroad boxcar. The OTV operates on the same principle as the Shuttle – it is a winged vehicle with thermal protection system and a payload bay for deploying and retrieving satellites or for conducting experiments. 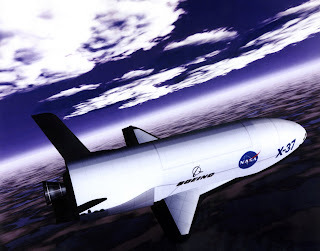 The X-37 was originally a NASA initiative - dubbed a “mini-shuttle” it was later transferred to DARPA (Defense Advanced Research Projects Agency) when budget constraints affected the program. The OTV was built by Boeing’s Phantom Works and it was Boeing’s Rockwell division that was the original contractor of the Space Shuttle. The X-37B is rumored to have a more advanced heat shield and can do something the Russian Space Shuttle Buran could do, but the America Space Shuttle couldn’t and that is operate without a crew and return to a landing strip on its own. Hopefully, the X-37B is just the beginning of a program that will continue the legacy of the shuttle program. If as former astronaut Story Mugrave put it that the shuttle can’t be made safe then the versatility and the capability of what the Shuttle program is will live on in an unmanned capacity through the OTV. An unmanned shuttle that could do all the things the current Shuttle does without the risk of crew would be the perfect vehicle to fulfill the original promise of the Space Shuttle program. This little known program could play a significant role in the future of the space program. While this version of the OTV is small by comparison to the Space Shuttle it presents an ideal opportunity to test out the systems and advanced technologies to develop a much larger unmanned Shuttle or perhaps another winged crew delivery vehicle along the lines of the proposed European Space Agency’s Hermes or the Russian Clipper. The OTV program allows us to avoid a critical mistake we have repeated during the history of the American Space Program - that mistake was to follow a path to “develop and discard” technologies that we’ve worked hard to perfect and advancements that we’re paid with both sacrifice and national treasure. While this is an initial small step towards a future larger unmanned Shuttle it is nonetheless an important step to retaining and evolving winged reusable spacecraft. We’ll watch this initial checkout launch carefully and hope that the current budget and economic conditions that doomed the original X-37 program don’t haunt the Air Force’s reincarnation of this much needed capability.